In the world of digital marketing we do a lot of team-based work. We have PPC and SEO teams working together on projects and clients, management teams working to bring in business or work on internal processes, and whole agencies that need to work together as teams on a daily basis to keep things running. I’m going to share a teamwork model with you from my favorite organizational health guru, Patrick Lencioni. In his book, The Advantage: Why Organizational Health Trumps Everything Else in Business, Lencioni describes five behaviors of functional teams. I have personally used this model in organizations before, adapting it to each group, and have seen tremendous results. The foundation for cohesive teams is trust. Lencioni says “Team members who trust one another are comfortable being open, even exposed, to one another about their failures, weaknesses, and fears.” It makes a huge difference when you actually get to know the people you’re working with. Until your team can get over their fear or discomfort with being vulnerable with one another, trust can never truly build. I have seen large changes in teams’ interpersonal comfort levels once they get to know their teammates even one level below the surface. There are plenty of team building exercises out there that can help with this. But the one I’ve used most often is the personal histories exercise. The personal histories exercise is a simple, quick way to get to know your teammates a little better. It allows people to be vulnerable in an organized, low-risk setting. Here is the exercise outline. The team leader should go first in any sort of sharing to set a good example of what’s expected. Next we have conflict. Lencioni says “When trust is present, teams are able to engage in unfiltered ideological debate around ideas, issues and decisions that must be made.” In other words, once you have trust, you can have productive conflict. A lot of people in business have a natural tendency to preserve “artificial harmony.” We want to put on a happy face, agree with everyone, and not step on any toes. But this doesn’t allow for good, productive, problem-solving conflict. Leaders should be able to mine for conflict if it is not apparent. There is often some form of it going on whether the team is talking about it or not. This is where I’d suggest a team effectiveness exercise. When I’ve done this exercise it has usually been a little uncomfortable at the start, but is worthwhile in the end. Its purpose is to provide a forum for focused feedback on how each member can improve overall team performance. Here is the exercise outline. Commitment builds upon the foundation provided by trust and conflict. Lencioni puts it this way: “The ability to engage in conflict and provide input enables team members to buy-in or commit to decisions.” If team members all feel comfortable giving their input, and are able to engage in good conflict during decision making, each member should feel like the decisions are partially their own. People are much more likely to commit to something they feel ownership of than something simply thrust upon them. The leader should make sure everyone is invited into discussion concerning important plans and decisions, but know when to bring that discussion to a close; otherwise it can go on forever! 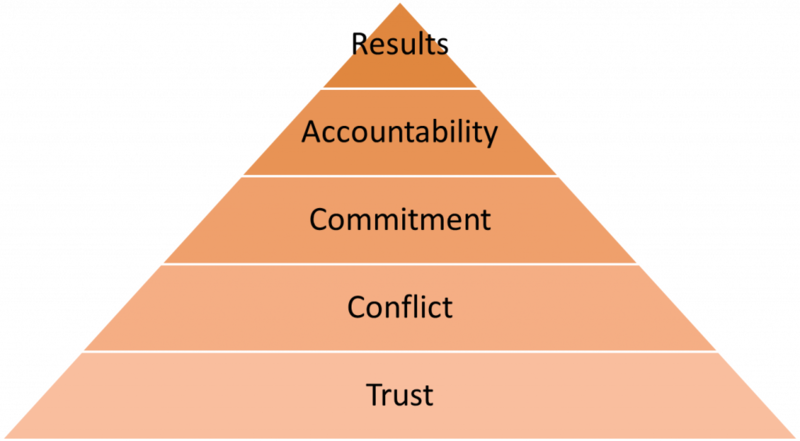 “After commitment is established, team members must be willing to hold one another accountable and remind each other when actions are counterproductive to the team.” Lencioni is definitely right about this. I’ve seen many teams commit to decisions only to lose motivation later, or individuals commit to behavioral changes and then fall back into the same habits. Holding people accountable to things like that is usually more effective (depending on the situation) when it comes from a peer rather than a superior. This is especially true when you trust this peer and know they are sincerely trying to give you a helpful reminder and not tear you down. People may try to preserve artificial harmony here for fear of looking like the bad guy. The team leader should confront these issues and find out just what is keeping team members from feeling accountable themselves, or uncomfortable with holding each other accountable. The last behavior is focusing on results. Lencioni says “Collective team results must supersede any departmental or personal objectives or pursuits.” Often times, teams are made up of people from different departments with their own objectives and projects going on. At the very least each person on a team will have personal goals and things to get done. But if the previous four behaviors are being practiced well by all, then the team’s results should genuinely be the most important for every team member. This is significant because if everyone is more concerned with their own pursuits then it will detract from the focus on the team’s success. The leader should be over-communicating what is most important and why. I hope this summary can help you examine your own teams and better determine how healthy and cohesive they actually are. What have you done to promote team health and functionality?